Author Written by Suruthi G. and last updated on Posted on January 12, 2018 . For a good understanding of MRP processes in SAP, one should know the difference between SAP MRP (Materials Requirement Planning) and SAP CBP (Consumption-based Planning). 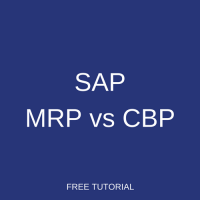 This tutorial is part of our free SAP MM course and it provides an insight about SAP MRP vs CBP. We will explain the basic differences between MRP and CBP. As the name indicates, SAP MRP is necessary to provide material availability for the requirements. The planning would be carried out for the materials against the requirements. In MRP, a planning run is carried to calculate net requirements. MRP calculates the net requirements using current and future requirements as input. The planned requirement quantity that comes as an output of the planning run would trigger requirements calculation. In MRP, the requirements would be driven by documents like sales order, material reservations, planned independent requirements, and dependent requirements that come as a result of BOM explosion during the planning run. The main objective of MRP is make the material available in the right quantity at the right time which could then consumed or delivered based on the requirements. As the name indicates, this planning would be carried out based on the consumption values. The consumption values are the past historical consumption data. This data would then be used to calculate future requirements with the help of a forecasting program. For example, the requirements could be triggered when the material stock level falls below a reorder point. The reorder point would be calculated based on the past historical consumption data. There is another stock known as safety stock level. The safety stock should be maintained for the respective material to plan for the requirements and also for any unplanned delivery or any unexpected delay in supply from vendors. 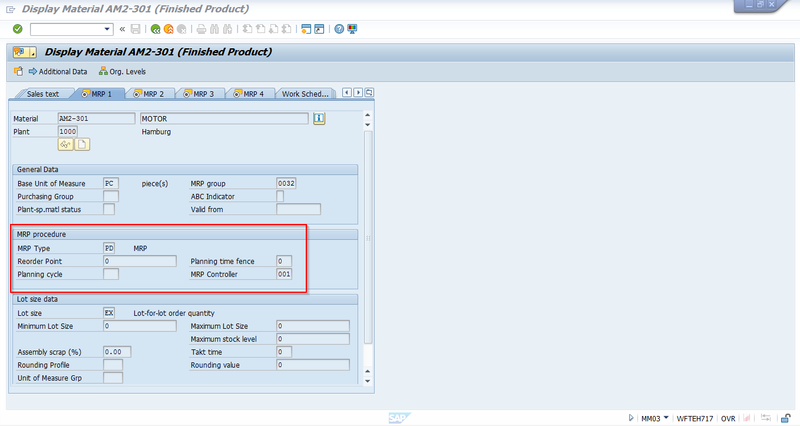 MRP and CBP both are MRP procedures in SAP. They determine how the materials are planned and made available to meet the requirements. MRP calculates the net requirement by considering the warehouse stock and scheduled receipts. CBP calculates the requirements based on events like when the stock level falls below the reorder point. CBP contains procedures like reorder point planning, forecast-based planning, time-phased planning. Reorder point planning could further be classified into manual and automatic reorder point planning. The figure above shows the material master MRP 1 view. The MRP procedure could be set up in this view with the required MRP type. MRP type is a field which is used to define and determine the MRP procedures. If the MRP type is set to ND, then it means no planning, i.e. no planning run is carried out for those materials. Then, there is no MRP procedure required for materials that require no planning. When the MRP type is set to PD, it means that those materials require planning. When PD is set up in the MRP type field, it means MRP procedure. The other MRP parameters would need to be set up in the material master, to make the planning run to be carried as per our requirements. If the MRP type is set to R1, then the procedure is time-phased planning procedure. This procedure would be suitable for materials that are supplied by vendors in a regular interval like two days in a week or only on some particular days. When the MRP type is set to VB, then manual reorder point planning procedure could be activated. In this procedure, the safety stock and reorder point would be calculated manually and entered in the SAP system. If the MRP type is set to VM, then the MRP procedure could be determined as automatic reorder point planning procedure. The safety stock and the reorder point would be calculated automatically by the system based on the past historic consumption data. When the MRP type is set to VV, it means we are determining a forecast-based planning. The requirements could be calculated based on the forecast data that was maintained in the material master. The main difference between MRP and consumption-based planning is in the requirements calculation. MRP uses warehouse stocks, scheduled receipts and the requirements would be from sales order, dependent requirements, order reservations, BOM explosions, etc. Consumption-based planning calculates requirements when the stock level goes below the predetermined reorder point. The requirements would be triggered by the past historical consumption data and forecast data. Though the above mentioned MRP types are available in the standard SAP, customized MRP types could be configured based on the business requirements. It could be configured with the help of copy option from the already available MRP types, and changing the required fields to suit the business requirements. SAP consumption-based planning (CBP) could be used for planning B and C materials. As this procedure could trigger requirements with less effort and setup, it could be used for planning operating supplies also. On the other hand, materials requirements planning (MRP) could be used for planning A materials. As the stock level of A materials is very important and required to determine crucial decisions on materials, MRP would be used for planning of A materials. MRP calculates the material requirements based on the requirements triggered by the warehouse stock, scheduled receipts and issues. When we describe warehouse stock, Material Requirements Planning would consider stock in both quality and unrestricted for available stock. MRP does not include blocked stock, during planning run it excludes the blocked stock. You’re right, we’ve update the tutorial. Thanks!